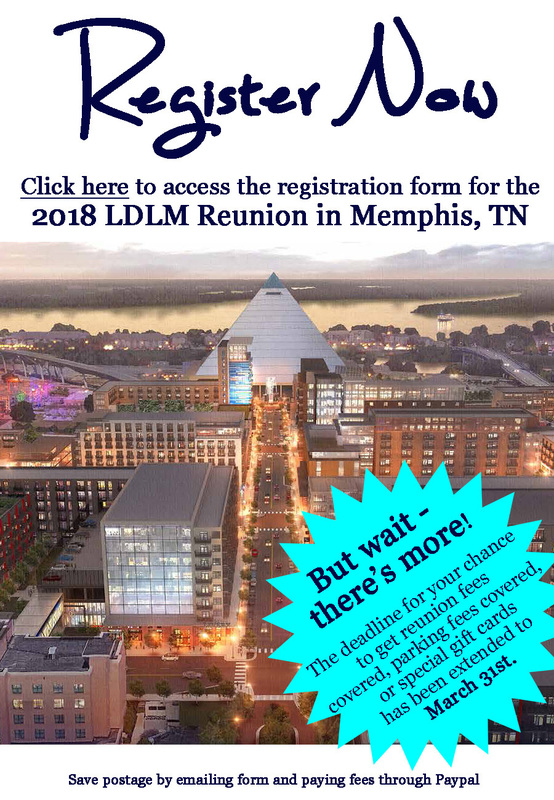 LDLM Family, please see the following 2019(71st Annual) LDLM Family Reunion Letter and Registration Form. We are looking forward to seeing each of you! Leave your own birthday message below in the ‘Comment’ field, for Uncle John! Book your hotel rooms now. Our host hotel for this year, will be the Drury Inn at the Space and Rocket Center. The group rate is 114.99 per night. Cut off date for reservations is June 23. Select link below to view pics now! A Celebration of Life for Mrs. Marjorie Lightfoot Looney, 90 of Decatur, AL. will be 2:30 PM, Sunday at St. James C.P. Church in America and burial in Sterrs Cemetery. Mrs. Looney passed away Tuesday, August 22, 2017 at Madison Hospital. She is the mother of Mrs. Phyllis Looney-Jones of Huntsville, AL. Happy Birthday, Helen and Ellen! The twins turn 91 today(May 9th)! Leave your birthday wishes, in the Comment section below. 2017 LDLM Family Reunion Packet now available! Please reach out to a Reunion Committee member, for any questions or concerns. Contact information is located in the reunion letter. Wilma Jean Johnson Tigue, daughter of Robert Johnson and Lela Lane Johnson passed on March, 08, 2017 in Panorama City, CA. Funeral services were held at Bethany Bible Church in Sylmar, CA on March 16, 2017.